Beaumaris is the great unfinished masterpiece. It was built as one of the North Wales "iron ring" of castles by the English Monarch, Edward 1, to stamp his authority on the Welsh, but it was never finished. Money and supplies ran out before the fortifications reached their full height. 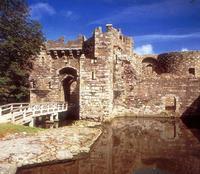 Beaumaris is nonetheless an awesome sight, regarded by many as the finest of all the great Edwardian castles in Wales. Begun in 1295, it was also the last. The king's military architect, James of St George, brought all his experience and inspiration to bear when building this castle, the biggest and most ambitious venture he ever undertook. In pure architectural terms Beaumaris is the most technically perfect castle in Britain and has few equals. Its ingenious and perfectly symmetrical concentric walls within walls design, involving no less than four successive lines of fortifications, was state of the art for the late 13th century. The stronghold stands at one end of Castle Street, inextricably linked with the history of the town. This was the "beau mareys" (fair marsh) that Edward chose for a castle and garrison town.From the outside Beaumaris appears almost handsome, it does not rear up menacingly like other fortresses but sits amid a scenic setting overlooking mountains and the sea partially surrounded by a water-filled moat. The gate next-the-sea entrance protected the tidal dock which allowed supply ships to sail right up to the castle.There is so much to see here - 14 separate major obstacles that any attacker would have to overcome, the hundreds of cleverly sited arrow-slits, the deadly use of murder holes to defend entrances. A545 (Menai Bridge) A5 (Bangor).